The trend in digital front-ends these days is increasingly toward CD players. Manufacturers offering separate transports and digital processors are now combining their technology in one chassis, with the attendant cost savings. CD players are not only easier to set up and use than separates, but they also have the advantage of potentially lower jitter. With no interface between the digital source and the processor, there can be no interface-induced jitter. Besides, a CD player takes up less space in your rack-less “system clutter,” as Stereophile’s Sam Tellig says. Description: CD player with HDCD decoding. Digital filter: Pacific Micro sonics PMDIOO (8x-oversampling). Digital output: 75 ohm coaxial on BNC jack. Analog outputs: Single- ended on RCA jacks. Output voltage: 1 .5—2.5V (variable). Dimensions: 13” W by 3.75” H by 13.5” D. Weight: 15 lbs. Serial number of unit tested: 10062. Price: $1295. Approximate number of dealers: 200. Manufacturer: Audio Alchemy Inc., 31133 Via Colinas #111, Westlake Village, CA 91362. Tel: (818) 707-8504. Fax: (818) 707-2610. Description: CD player with tubed output stage. Output impedance: 370 ohms. No other audio specifications provided. Dimensions: 18” W by 5.5” H by 15” D. Weight: not specified. Serial number of unit tested: 96376. Price: $1495. Approximate number of dealers: 62. Manufacturer: Audio Electronic, 111A Woodwinds Industrial Court, Cary, NC 27511. Tel: (919) 481-4494. Fax: (919) 460-3828. Description: CD player with HDCD de coding. Outputs: analog on RCA jacks, digital on RCA and TosLink jacks. Dig ital/analog conversion: dual Burr- Brown PCM63 20-bit DACs. Digital filter: Pacific Microsonics PMD100 running at 8x. Digital output level: 0.5V p-p. Frequency response: 5Hz—20kHz, ±0.5dB. Dynamic range: >100dB. Channel separation: >100dB, full band width. Signal/noise ratio: 115dB, A- weighted. Analog output impedance: 120 ohms. Analog output level: 2V. Dimensions: 18.5” W by 4.8” H by 14.3” D. Weight: 17 lbs. Serial number of unit tested: none. Price: $1495. Approximate number of dealers: 130. Manufacturer/Distributor: Rotel of America, P.O. Box 8, North Reading, MA 01864-0008. Tel: (508) 664-3820. Fax: (508) 664-4109. 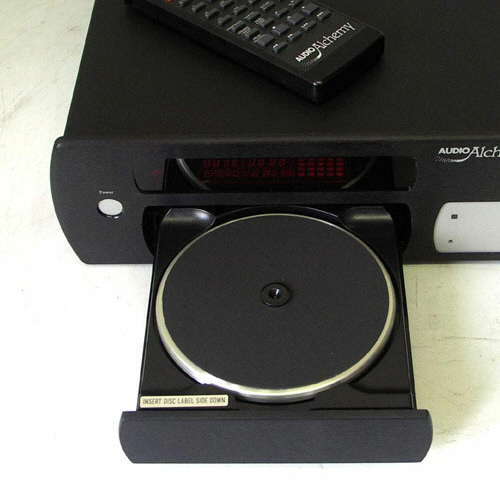 A perfect example of this trend is Audio Alchemy’s new ACD-Pro CD player. The $1295 unit combines the mechanism of AA’s DDS Pro transport ($699) with many features of the company’s popular, high-value DDE v3.0 digital processor ($799). The ACD-Pro is rather odd-looking, with a squat, narrow profile. A red display in the upper left corner shows the machine’s operating status. The small display numbers are readable only when you’re fairly close to the unit—quite a contrast with the Rotel RCD-990’s comparatively huge display. The large transport drawer sits below the display. Opening the drawer reveals a transport mechanism unlike those in most CD players. First, instead of putting a CD label-side up in an open tray, you put the CD in upside-down on a flat platform the size of the disc itself. And unlike standard transports, which hold the CD on a center spindle where it can flop around, the ACD-Pro’s transport made by Pioneer and called the Stable Platter Mechanism -- holds the entire disc while it is spinning. Sup porting the entire CD while it is read is intuitively a good idea —the absurdly expensive Teac VRDS mechanism, used in the Wadia 7 transport, takes this concept a step further by not only holding the entire disc, but also clamping it over its entire surface area. Transport control is via a square membrane panel in the front panel’s lower right corner. I’m not usually a fan of membrane panels, but this one worked fine —the ACD-Pro responded quickly and reliably to track-skip commands from the front panel or the remote control. The rear panel provides single-ended outputs on gold-plated RCA jacks. A digital output is included in case you want to use the ACD-Pro as a transport. This digital output is on a BNC jack, not an RCA connector. BNC is a much better termination for a digital audio cable, but few processors are fitted with BNC. I recommend against using a BNC-to-RCA adaptor; use a cable fit ted with RCA on one end or BNC on the other if you can’t use BNC-to-BNC connection. The supplied remote control is a square unit with rows of similarly sized buttons. Consequently, it was less friendly to use than the Rotel or Audio Electronic remotes. It did, however, operate over a wide range of positions. One unique feature of the ACDPro is something called Peak Search. Pressing this command on the remote control with a disc loaded makes the player scan the entire CD to find the highest recorded level. After scanning the disc, the ACDPro plays and repeats about 10 seconds of the highest level. This feature is useful for making tapes of CDs: You can set your recorder’s meters while the ACDPro is repeating the highest level on the disc, and never again be surprised by higher-than-anticipated levels on your recordings. No if only this feature were possible when making live recordings! The inside story: The chassis is laid out with the transport mechanism up front and the electronics in a subchassis at the unit’s rear. This enclosed subchassis holds the Pioneer transport-control electronics board on one layer and the Audio Alchemy decoding board just above it. Two transformers separately supply the transport/display and the audio electronics. Eleven regulators are distributed around the decoder board, and other TO-220 (three-pin) regulators power the transport mechanism. A Pacific Microsonics PMD100 HDCD decoder/filter performs 8x-oversampling and HDCD decoding. The 6dB of attenuation of non-HDCD sources required by the HDCD license is performed in the analog domain, a better-sounding alternative to digital- domain attenuation. In addition, the PMD100 is programmed to generate dither, a small amount of noise mixed in with the signal that makes the DACs behave better. The 8x-oversampled audio data are input to a pair of Analog Devices AD1862 20-bit DACs. The resistor-ladder 1862 is an older device, but one that can sound excellent. It has fallen out of favor because it needs the value of its Most Significant Bit (MSB) trimmed when installed in the circuit. Such trimming adjusts the value of the DAC’s MSB so that the transition from the lower 19 bits to the MSB is equal in amplitude to any other quantization step. The MSB trimmer is adjusted so that it is exactly one quantization step above the 19 Least Significant Bits (LSBs). In the ACD-Pro, a pair of trimmer potentiometers (trim pots) sets the MSB value for each AD1862. A technician temporarily turns off the PMD100’s dither, then adjusts the trim pot for the best low-level linearity. The dither is then turned back on. The PMD100’s dither further improves the DACs’ low-level linearity once the MSB trimmer is set correctly. The DACs are followed by an unusual discrete FET current-to-voltage (I/V) converter. Most I/V converters are op amps, chosen for their high speed, low cost, and easier pcb implementation. It is unusual to find a discrete I/V in a moderately priced product. This is the same I/V stage (and DACs) used in Audio Alchemy’s great-sounding DDE v3.0. The direct-coupled analog output stage is based on an Analog Devices AD823 op-amp. Removing jumpers in the analog stage reduces the gain. With the jumpers in place, the ACD-Pro puts out 2.5V; without the jumpers, the unit’s maximum output voltage is only 1.5V. A split active/passive filter, similar to that used in the DDE V3, smooths the output and removes high-frequency spuriae. In fact, the entire topology is quite similar to the DDE v3.0’s. With the basic DDE ‘3, however, the 6dB of attenuation is performed digitally (at the expense of 1 bit of resolution), and the PMD100’s dither-generating option is only used when you order the $149 remote-control upgrade (the remote-control microprocessor also programs the PMD100 to output dither). Conversely, the ACD•Pro’s power supply isn’t quite as good the DDE v.3.0’s, and the ACDPro’s analog output filter is slightly less sophisticated. All in all, the ACDPro appears to offer quite a bit for the money. The ACD-Pro’s maximum output level when decoding a frill-scale 1kHz sinewave was 2.49V. This was sourced from a very low impedance of just under 1 ohm across the band, rising to 4 ohms at 20kHz. This ultra-low output impedance means the ACD-Pro won’t interact with the pre-amplifier it drives. DC levels were moderate at 4.3xnV and 4.5niV in the left and right channels, respectively. Unusually, the ACD-Pro inverts absolute polarity: A positive-going impulse on a test CD is reproduced as a negative-going impulse at the analog output. The ACD-Pro’s tracking ability was only fair; the player skipped at track 33 on the Pierre Verany Test Disc. 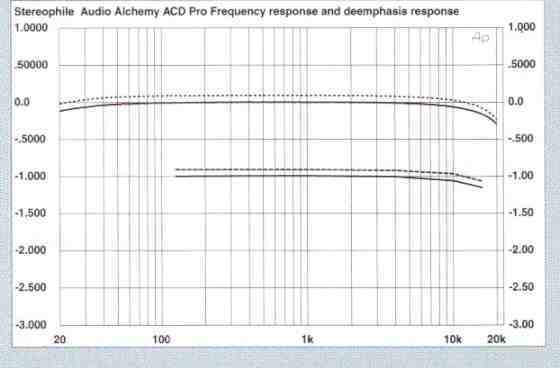 Fig.1 is the ACD-Pro’s frequency and dc-emphasis responses. The unit is flat across the band, and the dc-emphasis tracking is perfect. Channel separation (not shown) was excellent at better than 90dB below 3kHz, but considerably better concerning leakage from the right to the left channel than in the other direction. 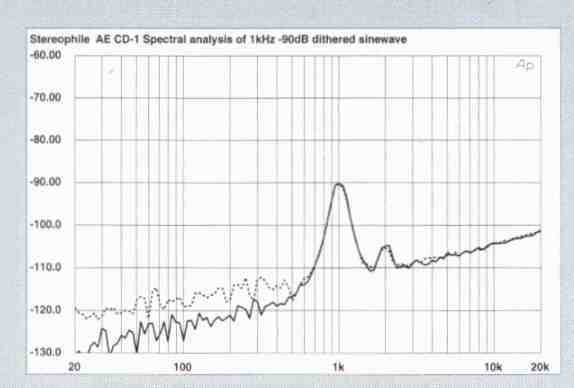 A spectral analysis of the ACDPro when it was playing a 1kHz, -90dB dithered sinewave (fig2) shows a considerable amount of power-supply noise in the audio output. In addition, the right-channel DAC appears to have a negative linearity error, along with trace of second-harmonic distortion. A wideband spectral analysis with an input signal of all zeros (fig.3) shows no unusual behavior other than the power-supply noise. Fig. 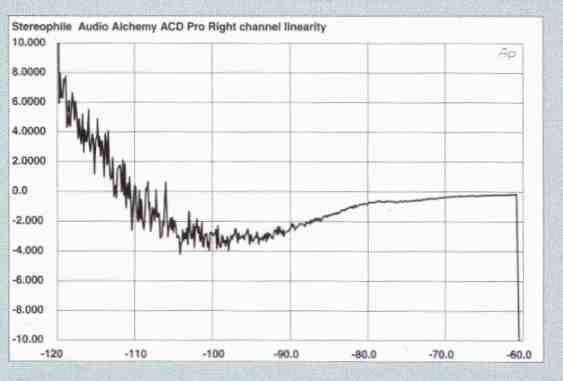 1 Audio Alchemy ACD-Pro, frequency response (top) and de-emphasis response (bottom) (right channel dashed, 0.5dB/vertical div). 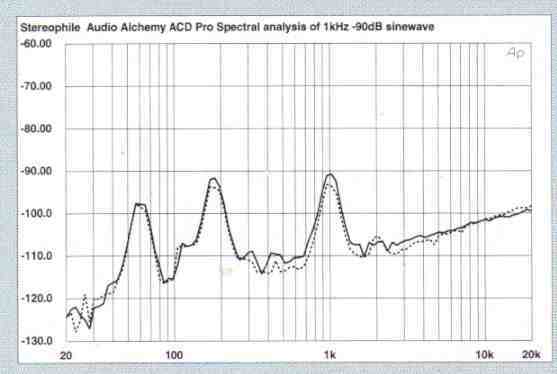 Fig 2 Audio Alchemy ACD-Pro, spectrum of dithered 1 kHz tone at -90.31dBf with noise and spuriae (16-bit data, / analysis, right channel dashed). 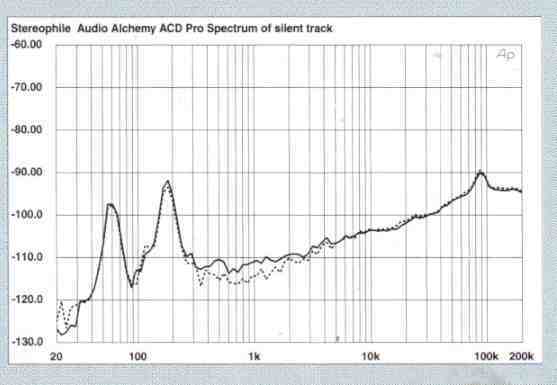 Fig 3 Audio Alchemy ACD-Pro, spectrum of digital silence (16-bit data, 1/3-octave analysis, right channel dashed). As suggested in Fig.3, the ACD-Pro did indeed have a right-channel linearity error (flg.4): a —90dB input signal is re-created at -92dB. This is simply a function of correctly setting the right channel’s MSB trimmer; the left channel’s linearity was spot-on. Judging from its reproduction of a 1kHz, -90dB Undithered sinewave (fig 5), the ACD Pro must use one of the PMD100’s higher dither settings. In addition to the dither, we can see that the waveform “rides” on a low-frequency component — the power-supply noise we saw in fig. 2. Playing a full-scale mix of 19kHz and 20kHz, then plotting the output spectrally, produced a spectrum (not shown) that was clean and free from IMD products. The 1kHz difference product, for example, was at -99dB! I began this review by mentioning that CD players can have a jitter advantage over separate transports and processors, provided that the CD player is well-engineered. This was con firmed by the ACD impressive jitter performance. The player had a low level of jitter, no periodic jitter components, and the jitter spectrum and level were completely unaffected by the signal being processed. 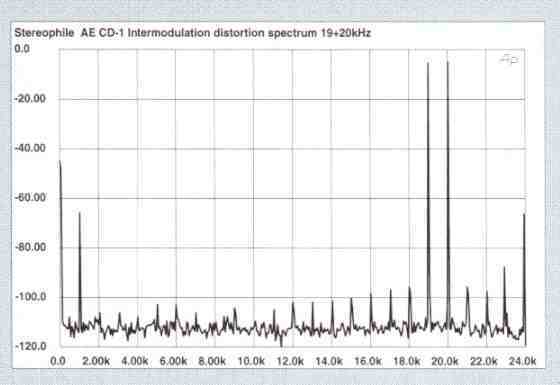 This can be seen in fig.6, the ACD jitter spectrum when playing a full-scale 1kHz sinewave. The spectrum shows no periodic jitter. Moreover, the RMS jitter level, measured over a 400Hz— 20kHz bandwidth, was just 17 picoseconds. Repeating the RMS measurements and plotting the jitter spectra with a test signal of all zeros or a 1kHz, -90dB sinewave showed no change in the jitter level or spectra. This is among the best jitter performances I’ve measured. The ACDPro’s technical performance was mixed. Although the unit had a low output impedance, good channel separation, and extremely low jitter, the player also had some power- supply noise in the audio output, and that right-channel DAC linearity error. It’s doubtful that you’d hear the power-supply noise, and the DAC linearity may vary from unit to unit because it’s determined by how care fully the unit is trimmed at the factory. 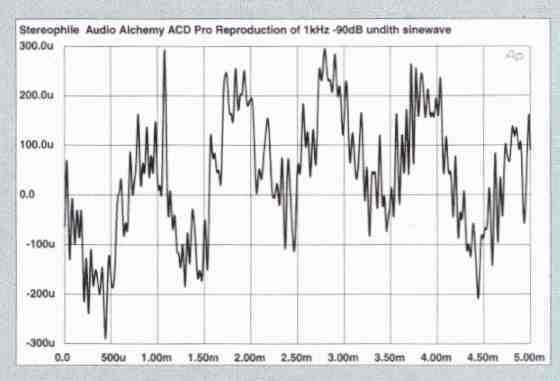 Fig.5 Audio Alchemy ACD•Pro, waveform of undithered 1 kHz sinewave at -90.31dB (16-bit data). 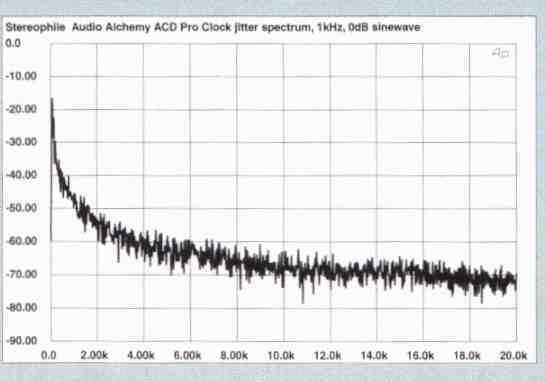 Fig.6 Audio Alchemy ACD word-clock Jitter spectrum, DC-20kHz, when processing 1kHz sinewave at 0dBFS, PS Audio Lambda transport (linear frequency scale, 10dB/vertical div., 0dB=1ns). Listening: I liked the ACDPro right out of the gate: It had a nice smoothness, warmth, and lack of treble brightness. Its overall perspective was also a bit more laid-back than other AA digital products, which I found appealing. The ACDPro’s relaxed perspective and lack of treble aggressiveness combined to produce a sense of ease and involvement — I could listen to the ACDPro for hours without fatigue. Compared with the Rotel RCD-990, the ACDPro was more forgiving of bright CDs and sounded less lively and immediate over all. Moreover, the ACDPro was far smoother and refined than the Audio Electronic CD-1. The flip side was a slightly reduced sense of clarity and transparency from the ACDPro —the Alchemy player had a hint of opacity next to the crystal- clear Rotel. This slight thickening of the sound tended to make the ACDPro less resolving of low-level detail. I also heard a less open and expansive sound- stage from the ACDPro; the Alchemy player was a little closed-in around the edges compared with the expansive RCD-990. Image focus was excellent for a player of this price, as was the resolution of space around image outlines. The ACDPro was less vivid in its soundstage presentation than the RCD 990, which made the Alchemy machine sound less immediate and palpable. For example, Keb’ Mo’s vocals on his self- titled debut disc (OKeh EK 57863) didn’t have quite the same “in-the-room” presence through the ACD•Pro, but the texture was a little softer and smoother than through the RCD-990. Keb’ Mo’s National guitar didn’t have quite the bite it had through the Rotel player. The three CD players saw action in what has evolved into my budget reference system: connected to a Linn Majik-I integrated amplifier through AudioQuest Quartz or MIT Terminator 2 interconnects and driving Linn Tukan ($799/ pair) or Aerial 5 ($1295/pair) loud speakers. (Both speakers are under review for a future issue, along with the $199/pair B&W DM302. Loudspeaker cables were MIT Terminator 2 hi-wire. The system sat on a Billy Bags 5500-series component rack, and power conditioning was provided by the $279 Audio Power Industries Power Pack II. For a reference, I used the excellent Sonic Frontiers SFCD-1, a $3495 tubed player that I hold in high regard. The three players also went head-to-head in matched-level comparisons. Similarly, the ACDPro was a little laid-back in the mids, a quality I enjoyed. Listening to the ACDPro was like taking a seat a little farther back in the hall. Solo instruments were placed slightly behind the loudspeaker plane rather than being pushed out front. This was an advantage over the RCD 990 on recordings that were too forward, but overall I preferred the RCD-990’s greater palpability and immediacy. The ACD-Pro had tremendous bass weight, definition, and dynamic impact. The entire bottom end had a solidity that provided a firm musical foundation, tonally and rhythmically. Acoustic bass was well rendered, with a perfect balance between weight and definition. I could easily hear the dynamic envelope of acoustic and electric bass strings, along with a clear sense of pitch. Bass dynamics were also excellent, with good slam and resolution of micro-dynamics. I really enjoyed the ACDPro’s great pace and timing, but thought the Audio Alchemy player was eclipsed in this regard by the Rotel RCD-990. Conclusion: The Audio Alchemy ACDPro is a great-sounding player that won’t break your bank account. Its best qualities were a smooth treble, relaxed perspective, a weighty yet defined bass, great dynamics, and excellent sense of pace and rhythm. Although the ACD-Pro’s soundstaging was good, it lacked the transparency, expansiveness, and bloom of the slightly more expensive Rotel RCD-990. In fact, the ACDPro made an interesting contrast with the Rotel player. Where the RCD-990 was immediate, incisive, and almost analytical, the ACDPro was more laid-back and for giving. The Rotel gives you more information, but the ACDPro has greater ease. Overall, I preferred the RCD-990, but I can imagine that some systems (and listeners) may be better suited to the Alchemy player. On a functional level, I liked the ACDPro’s front-panel transport controls and quick response, but not the remote-control layout or the small front-panel display. Before you buy similarly priced separates, listen to the ACDPro. 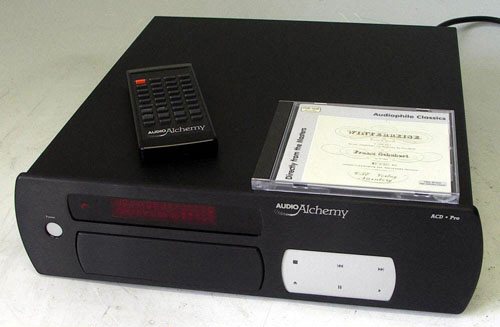 Audio Alchemy’s new player packs a lot of musical value in a modestly priced package. Cary Audio, the North Carolina company known primarily for championing single-ended tubed amplifiers in America, in 1993 created a separate company to supply audio hobbyists with do-it-yourself kits. The company, initially called Audio Electronic Supply, became successful selling kits and parts to enthusiasts on a budget, or to those who wanted the satisfaction of building their own hi-fi components. 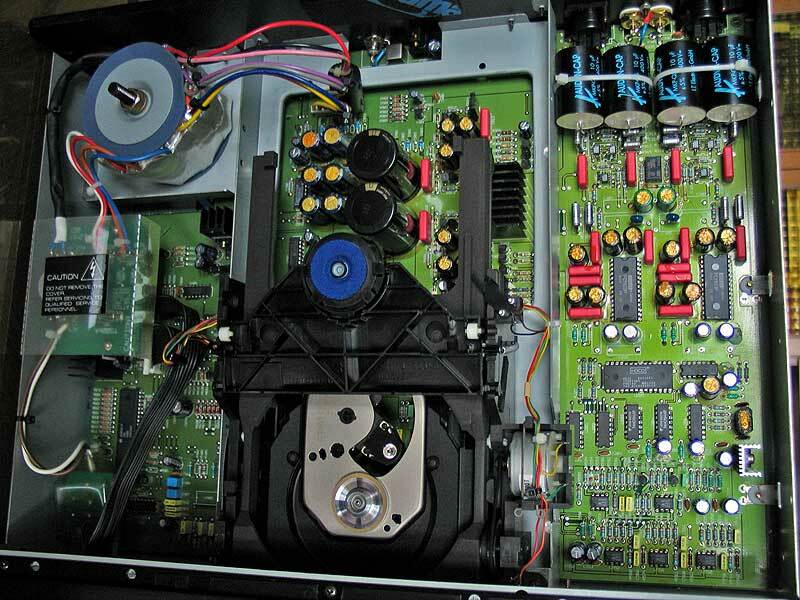 The factory-direct AE products were popular with college students; the age of the average AE customer was 24 years — a good sign for the future of high-end audio. Audio Electronic. The completed components are lower in price than the Cary line, and are available directly from Cary or through any authorized Cary dealer. The $1495 Audio Electronic CD-1 reviewed here is one of the first such completed products from AE. The CD-1 starts life as a Marantz CD-63, but bears little resemblance to the popular Marantz player outside or inside. Cary buys the Marantz players, removes the transport, display, and circuit board, and junks the rest. The CD-1’s chassis is much larger, deeper, and heavier than that of its $399 cousin. It’s made from 0.80-gauge aluminum, which designer Dennis Had believes is better-sounding than a ferrous chassis material such as the common cold-rolled steel. The Marantz front panel has been replaced by a ½-inch thick machined piece, which gives the player a more serious look. The drawer is also faced with a thick piece of machined aluminum. The CD-63’s front-panel controls have been reduced to Track Skip, Play, and Open/Close in the CD-1. Note that the front panel has no Stop or Pause function. If you’re operating the CD-1 standing at your rack, the only way to stop a disc is to open the drawer. A full-function remote control operates the player’s other functions. The rear panel has a pair of single-ended RCA analog output jacks and an RCA digital output. The Inside Story: The disparity between the Marantz CD-63 and Audio Electronic CD-1 is even wider with the CD-1’s top cover removed. 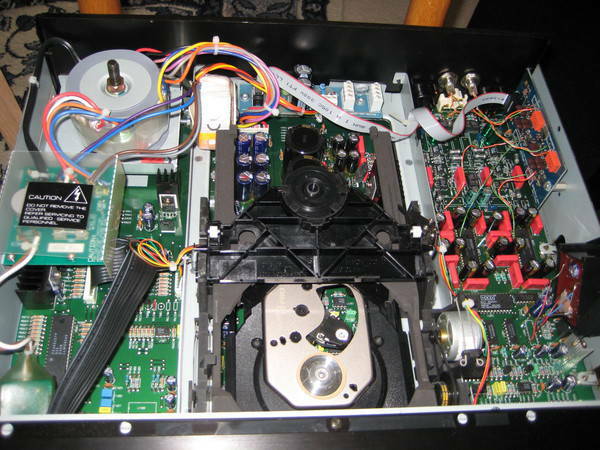 Although most of the chassis is consumed by the stock Marantz circuit board, not much of its circuitry is used. What is used is Philips’s drive mechanism, decoding electronics, servo systems, and everything else associated with the transport. The decoded transport output is converted to an analog signal with an NPC SM5872BS 1-bit DAC (with an integral digital filter) running at a 32fs rate. The DAC/filter is a surface-mount device located on the underside of the main pcb. The master oscillator is encased in a damping compound — a technique also used in the Rotel RCD-990. The CD-63’s analog output stage is bypassed in favor of the tubed stage designed by Dennis Had. The DAC’s differential output is converted to a single-ended signal by a differential buffer, then filtered to remove any RF noise injected by the DAC. Had chose the CD-63 for modification in part for its already low level of RF noise in the out put. He discovered that many 1-bit players produce high amounts of RF noise over a wide bandwidth; it’s no coincidence that the CD-63 measures well in this regard, and has received universal critical acclaim for a budget machine. Because the tubed output stage inverts polarity, the signal is inverted in the digital domain at the differential buffer. This makes the CD-1 non-inverting from CD to final analog output. A three-pole passive analog filter follows the RF trap. Two large potentiometers are mounted to a panel inside the CD-1 to fine-tune the analog filter’s response. Each CD-1 is hand-trimmed for best reproduction of a 1kHz square wave, which is injected into the signal path after the DAC. The passive filter’s 8dB of insertion loss is made up for with a voltage gain stage consisting of a 5814 tube (a low-noise version of the 12AT7) run as an anode current-source amplifier. The 5814’s plate is supplied by a tubed constant-current source (another 5814). A third tube, a 12AT7, forms the output buffer. The entire circuit is direct-coupled, save for one Kimber coupling cap between the 12AT7 and the analog output jacks. Output impedance is specified at a moderate (for a tubed output stage) 370 ohms. Most of the additional size and weight the CD-1 brings to the basic CD-63 is due to the CD-1’s massive power supply. In addition to the stock power transformer that supplies the transport mechanism (and the analog stages in the stock CD-63, unused in the CD-1), Cary adds two transformers, one of them a large unit for the high- voltage supply. The rectifiers in the high-voltage supply are massive — the pair of them is nearly the size of a pack of playing cards. These unusual diodes are reportedly the fastest-switching high-voltage diodes available. Two large electrolytic filter caps, along with a bank of Solen film and foil caps, smooth the B+ rail. The 12V filament supply is regulated by a 5A, TO-3-packaged regulator (the three tubes’ filaments together draw only 450mA). The CD-1’s construction quality is excellent. This isn’t a kludged CD player, but a complete redesign that happens to use the transport mechanism and DAC of a budget machine. For example, the chassis and top cover are heavily damped with a layer of inert material. This damping material is also applied to the transport mechanism. The tubed output stage is wired with point-to- point wiring rather than a printed circuit board. Teflon-dielectric, silver conductor wire connects the Marantz circuit board to the tubed output stage, and is used in all the point-to-point wiring. Nonetheless, the CD-1 makes the assumption that the analog output stage is at least as important as the DAC and digital filter. The $1495 CD-1 has the transport mechanism, filter, and DAC of a $399 CD player. Conversely, I’ve never seen such a tweaky analog output stage (and power supply) in a $1495 machine. The CD-1 made for quite a contrast with the identically priced Rotel RCD-990. Listening: I’ll start with some of the things the CD-1 did well. First, the player had a good sense of palpability and immediacy without sounding for ward. I heard in the CD-1 some of the midrange bloom and magic that define single-ended tubed power amplifiers, including Cary’s excellent CAD 300SEI integrated amp. It’s a hard quality to describe, but it seems to spotlight solo instruments, bathing them in a halo of air and palpable presence. There’s a seductive directness of musical expression in single-ended tubed amplifiers that I heard in the CD-1, but to a much lesser degree than in the Cary CAD 300SEI. The CD-1’s design heritage was also apparent in the player’s expansive soundstage. The presentation had a good sense of air and space, with superb depth. Image focus was the least tight and defined of the three CD players under review, but the CD-1 made up for that with great depth, front-to-back layering, and an expansive sound. The CD-1 produced an output volt age of 2.67V when reproducing a full-scale 1kHz sinewave. The out put impedance measured 410 ohms across most of the band, decreasing to 325 ohms at 20kHz. When drivinga600 ohm load for the output impedance measurements, the CD-1’s output became current-limited, slightly clipping the negative portion of the wave. Clearly, the CD-1 likes to see a high input impedance in the preamplifier it’s driving. DC levels were hard to measure due to fluctuations caused by a very-low-frequency noise. The CD-1 doesn’t invert absolute polarity. Playing the Pierre Verany Test CD tracks that include intentional dropouts, the CD-1 played track 28 but not track 29. This is poor tracking performance. The CD-1’s 1-bit DAC is a surface-mount device; its location beneath the main pcb made it inaccessible for jitter measurements. The CD-1 has some ripple in the frequency domain, a result of the high oversampling digital filter (fig.1). I’m guessing that the 1dB of rolloff at 20kHz is partially the result of the CD-1 analog filter, which isn’t in the stock CD-63. The CD-1 has some emphasis en or (lower traces in fig.1), which will make pre-emphasized CDs sound a little softer in the treble. The CD-1’s channel separation was only fair, the crosstalk reaching -60dB at 10khz. A spectral analysis of the CD-1’s output when playing a 1khz, -90dB dithered sinewave (fig.2) shows that the CD-1 adds some second-harmonic distortion, likely created by the tubed output stage, given the good DAC linearity. The noise level is, however, remarkably low for a tubed player. The left channel (solid trace) is about 5dB quieter than the right. A wideband spectral analysis with an input signal of all zeros (fig.3) shows no artifacts in or above the audioband. 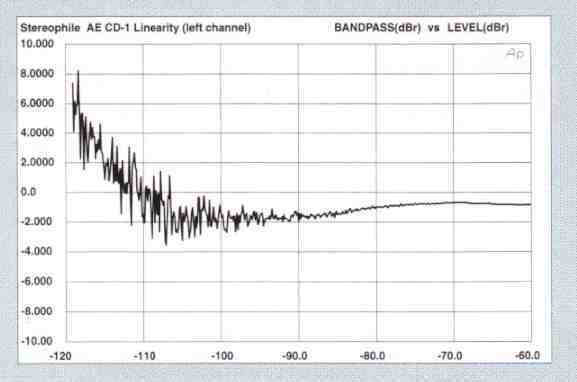 The CD-1’s linearity was good, but with a slight negative error below about —85dB. The left channel is shown in fig.4; the right channel was identical. 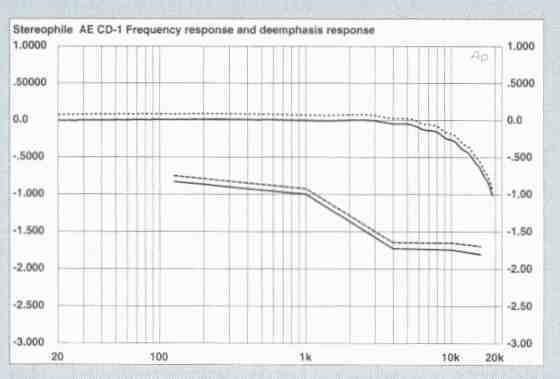 Fig.1 Audio Electronic CD-1 frequency response (top) and dc-emphasis response (bottom) (right channel dashed, 0.5dB/vertical div.). Fig.2 Audio Electronic CD-1, spectrum of dithered 1 kHz lone at -90.31 dBFS, with noise and spuride (16-bit data, i-octave analysis, right channel dashed). 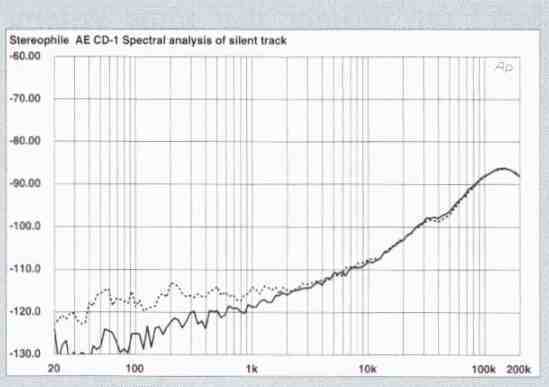 Fig.3 Audio Electronic CD-1 spectrum of digital silence (16-bit data, 1/3-octave analysis, right channel dashed). Fig. 5 Audio Electronic CD-1, waveform of undithered 1khz sinewave at 90.31dBFS (16-bit data). Fig.6 Audio Electronic CD-1, HF intermodulation spectrum, DC-22kHz, 19+20kHz at 0dBFS (linear frequency scale, 20dB/vertical div.). 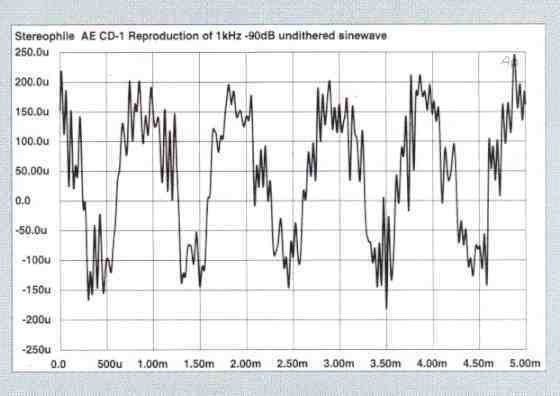 The CD-1’s reproduction of a 1kHz, -90dB undithered sinewave (fig.5) shows a fair amount of noise overlaying the signal, and an unusual-looking waveform. The positive portions of the wave are wider than the negative-going portions, and there’s more energy in the positive half of the waveform than in the negative half. In addition, the DACs appear to have some differential nonlinearity; note how the positive peaks all reach the 200uV horizontal division, while the negative peaks barely reach the -150uV division. This behavior is a function of the CD-1’s single-bit DAC. Finally, an FFT-derived spectral analysis (fig.6) plots the CD-1’s intermodulation distortion spectrum with the CD-1 playing a full-scale mix of 19kHz and 20kHz tones. The 1kHz difference component (20kHz minus 19kHz) is fairly strong at —66dB (0.05%), although the rest of the spectrum is fairly clean. The Audio Electronic CD-1’s technical performance was mixed. Although the player had low noise, its reproduction of low-level waveforms was unusual, and the player adds some second-harmonic distortion along with some intermodulation products. The CD-1’s bass was warmer-sounding than that of the ACD-Pro or RCD 990, which helped out the lean presentation of the Linn Tukan and Aerial 5 loudspeakers. The CD-1 added a little mid-bass weight, which made the music more full and rich. Bass guitar had more of a purring quality through the CD-1. Unfortunately, the CD-1 lacked bass dynamics and punch. Kickdrum was softened in a way that diminished its musical contribution. And bass guitar, while warm and hill, sounded a little slow and ill-defined. There was more low-frequency weight through the CD i than through the other players, but that weight was less precise and articulate. The CD-1’s bass can be described as more sound, less music. The CD-1’s biggest liability however, was its treble. Instead of sounding smooth and sweet like most tubed products, the CD-1 was bright and for ward in the upper octaves. This brightness was exacerbated by the treble’s hashy quality. Cymbals took on a bit of the “bursts of white noise” syndrome that makes them sound synthetic. Vocal sibilance was emphasized—the back ground vocals on “Wishing Well,” from Michael RufPs Speaking in Melodies CD (Sheffield Labs CD3S), for example. The treble was also grainy, and lacked refinement or inner detail. These characteristics made the treble seem like a noise riding on top of the music, not an integral part of the music’s harmonic tapestry. The upper midrange also lacked liquidity, imparting a screechy metallic character to violins. It was the CD-1’s reproduction of upper-midrange and treble textures that ultimately decided its fate. As much as I wanted to like the CD-1 for its midrange and soundstaging, I couldn’t get past the hard, unpleasant timbral rendering. Conclusion: Audio Electronic has taken an unusual approach in the CD-1: matching an inexpensive transport, digital filter, and DAC with a tweaky tubed analog output stage. Although the CD-1 had some of the Cary single-ended midrange magic, I was bothered by the player’s treble: It was forward, hashy, and lacked detail or refinement. And the bass, while warm and hill, was missing dynamic impact and rhythmic drive. As much as I tried to hear past these flaws to enjoy the CD-1’s special qualities, I ultimately found the CD-1 disappointing. For overall musical pleasure, the CD-1 was outclassed by both the Audio Alchemy ACD-Pro and Rotel RCD-990. While listening to the CD-1 critically, I had the impression that the tubed output stage was fighting a losing battle to make up for what the 1-bit DAC was doing wrong. The CD-1’s shortcomings —lack of dynamics and poor treble definition —are largely characteristics of 1-bit converters. I have great respect for designer Dennis Had, but I don’t think even he can overcome the limitations of the CD-63’s 1-bit DAC to make a product that’s competitive at the $1500 level. I can just hear the design team at Rotel telling management: “If we just had a larger build budget on our new CD player, we think we could produce something truly special.” The marketing department probably responded by saying “That may be true, but Rotel’s raison d’être is offering budget components to musically sensitive consumers. Rotel’s previous top-of-the-line machine, the RCD-975, sold for $799. The new RCD-990 lists for nearly double that amount at $1495--a whopping retail price for a Rotel CD player. I couldn’t help wondering what had compelled Rotel to depart from their fundamental budget philosophy to introduce such a lofty CD player. But after I’d auditioned it, I was more inclined to ask how Rotel couldn’t bring out the RCD-990. Functionality: The RCD-990 has a larger, sturdier look than the less expensive Rotel CD players. It’s also the most ambitious, with a design and parts quality beyond what you’d expect to find in a moderately priced machine. The front panel displays more information than do most CD players. In addition to indicating the track number and elapsed rime of track, the RCD-990 shows the index number, and when the disc is reading the CD’s Table of Contents data. A button on the remote control switches the display between elapsed time on track, remaining time on disc, and remaining rime on track. LEDs above the display indicate when the RCD-990 is decoding an HDCD-encoded disc, whether absolute polarity is inverted, and some programming functions. The display can be dimmed or turned off completely from the remote control. Front-panel controls include Play, Stop, Pause, Open, and Track Skip. All other functions are accessed from the remote, which will also adjust the muting attenuation in 5dB steps to —60dB. The muting attenuator’s 5dB steps are too coarse to use as a volume control (not to mention that the attenuation is performed in the digital domain). Analog output is via gold-plated RCA jacks and balanced XLR jacks. The RCD-990 is also equipped with coaxial (RCA) and TosLink digital out puts so the machine can be used as a transport to drive an external D/A converter. I enjoyed using the RCD-990. It is well laid out, although the tiny, rounded front-panel transport control but tons are less comfortable on the fingers than larger flat buttons. I also liked the smooth drawer operation, which contributed to the RCD-990’s overall favorable feeling. On the downside, the player was a little slow reacting to commands. The Inside Story: Removing the top cover revealed a chassis packed with components neatly and logically laid out. The toroidal power transformer, custom-designed and manufactured for Rotel, sits on a raised platform above the main circuit board. This isolation is enhanced by a layer of damping compound between transformer and platform. A generous amount of capacitance filters the DC supplies, with lots of smaller electrolytic capacitors distributed around the chassis. These are mostly Black Gate or Nichicon brands. Some of the power- supply regulation stages (probably the ±15V analog stage rails) appear to be discrete rather than IC designs. All the power-supply decoupling caps are Wima brand. Unfortunately, Rotel was unable to provide me with any technical information on the RCD-990; this description is based solely on my looking inside the player. The transport mechanism sits on a raised subchassis above the decoding electronics. A Philips CDM-9 Pro mechanism was chosen for its aluminum turntable and metal frame. The CDM-9 Pro is used in many high-end transports, including the excellent Theta Data Basic and PS Audio Lambda. Many manufacturers have switched to the CDM 12.4 transport, a CD-ROM mechanism that uses more plastic parts than the older, beefier CDM-9 Pro. In addition, the designed-for-audio CDM 9 Pro has provision for index search, t expensive feature to implement with a CD-ROM drive (manufacturers must write their own control codes to pro vide index search). Rotel takes the CDM 9 Pro a step further by adding a graphite disc-loading tray for greater resonance suppression. A Pacific Microsonics PMD100 HDCD decoder/filter performs 8x-oversampling. Unusually, the RCD 990 lets you choose which of the PMD 100’s dither modes is invoked. (This feature is also available on the California Audio Labs CL-10, but only when the CL-10 is connected to a personal computer.) Dither is a small amount of noise added to the signal that makes the DACs perform better. Pacific Microsonics provides seven dither settings (plus a no-dither option) to let the digital processor designer optimize the performance of a wide range of DAC chips. Rotel thinks the listener should decide which dither sounds best in a certain system. Turn the player off, then back on again while holding down the Play and Stop buttons. The display will show whether the digital output is turned on or off Pressing Pause toggles between digital. output on/off Turning off the digital output when using the RCD-990 as a CD player probably results in better sound because less noise is radiated with in the chassis. Pressing Track Skip puts the RCD-990 into dither selection mode. Again, Pause scrolls through the dither numbers. When the dither number you want is shown in the display, turn the player off, then back on again normally. (The owner’s manual has incorrect instructions for selecting the dither level.) I’ll report on the sound of these dither modes later. This ability to select the PMD100’s dithers is made possible by the RCD 990’s Motorola microprocessor. The device also provides the extensive display and programming functions, such as the variable display dimming and variable mute level. The DACs are a pair of Burr-Brown PCM63s, a high-quality 20-bit device used in many expensive processors. The PCM63 has excellent intrinsic linearity owing to its “Colinear” architecture, and needs no MSB trimming. The RCD-990 uses the middle “K” grade of PCM63. The DACs are followed by a Signetics NE5534 op-amp used as an I/V converter. A dual op-amp, a Philips NE5532, is the output buffer. A second NE5532 appears to be the phase splitter that creates the balanced output signal on the XLR jacks. Again, this circuit description is based on my observations; Rotel was unable to supply answers to my technical questions, including such issues as whether the 6dB of attenuation on non HDCD discs is performed in the analog or digital domain. A little trick I noticed inside the RCD-990 is a jacket of damping com pound tightly wrapped around the master oscillator. It has been reported that oscillators change their frequencies slightly when vibrated — in other words, a vibrating oscillator has higher jitter. This may be one reason why CD players, transports, and digital processors sound better when mounted on vibration-isolation devices. Mechanically damping the master oscillator is a nice touch in a moderately priced CD player, suggesting that the designers did their homework. Listening: During my casual listening, while the RCD-990 was warming up and breaking in, I noticed that the player made me stop what I was doing and sit down to listen to the music. Even without benefit of a full break-in, the RCD-990 already sounded musical, expressive, and involving — and it was still in “no dither” mode. The RCD-990 really bloomed after a few days in the system and the selection of dither #6. The following description applies to the RCD-990 in this dither setting (which I thought made the RCD-990 sound its best), and via the unbalanced analog outputs (the Linn Majik-1 lacks balanced inputs). The RCD-990 had excellent solidity and power in the bottom end. Kickdrum had satisfying impact and punch, while bass guitar and acoustic bass were reproduced with excellent pitch definition. The bottom end was taut, yet powerful and full. Moreover, the RCD-990’s dynamics were superb, the envelope of the kickdrum cutting through the mix. These qualities combined to make the RCD-990 immensely compelling and involving rhythmically. The player had an upbeat, visceral quality that I really enjoyed—I heard a remarkable rhythmic coherence that just sounded right. The RCD-990’s excellent pace was ideally suited to guitarist Ronnie Earl’s fabulous new Eye to Eye (AudioQuest AQ-CD1043), with Muddy Waters’s rhythm section of Pinetop Perkins, Calvin Jones, and Willie Smith. The RCD-990 was the best of the three players I’ve reviewed for this issue at conveying this music’s powerful rhythmic drive. I challenge anyone to sit still during this disc—particularly the Willie Dixon tune “Shake For Me,” with Jones laying down its propulsive bass line. But forget the fancy adjectives: The RCD-990 boogies. Although the Audio Alchemy ACD” Pro also had good pace, the RCD-990 was a bit more dynamic and upbeat. The Audio Electronic CD-1 had more mid- bass weight, but lacked the punch and impact of the RCD-990 or ACD-Pro. The CD-1 sounded slower than the other two players under review. The RCD-990’s bass dynamics ex tended to the rest of the spectrum. The player had a wide dynamic contrast, with a jet-black background for the music. This deep quiet between notes not only let the RCD-990 better resolve low-level detail, but made the contrast between loud and soft seem wider. In addition, impulsive sounds seemed to jump out of the presentation, giving the music more life, palpability, and snap. Low-level detail was reproduced with clarity and definition without sounding etched or hyped. The Rotel player’s combination of ease and resolution is rare in such an affordable digital front-end. Compared to the ACD-Pro, the Rotel player sounded more lively and up-front. This imbued the RCD-990 with excellent clarity, resolution, and immediacy, but at the minor expense of sounding very slightly bright. The overall perspective was just a little on the forward side of reality, a character that can be mitigated with the variable dither function. Conversely, the ACD-Pro was smoother in the treble, but also sounded less detailed and transparent. In addition, the ACD-Pro sounded a little closed-in in the top octave next to the more airy RCD-990. Although the ACD-Pro sounded smoother, the RCD-990’s treble was slightly cleaner and more re fined. This cleanness is what let the RCD-990 get away with having a brighter presentation without being aggressive or overbearing. Still, the ACD-Pro sounded a little more relaxed. The RCD-990’s soundstage was more like what I hear from $4000 processors than from $1500 CD players. The presentation was open and transparent, with a wonderful see-through quality. Images were tightly focused and precisely placed in the soundstage. I also heard space and air around individual instruments, along with a nice bloom around the sound- stage’s outer edges. This quality was particularly apparent in Zappa’s complex orchestral masterpiece The Yellow Shark (Rykodisc RCD 40560). The RCD 990’s ability to keep images separate and distinct from one another was far beyond what I’ve heard in comparably priced digital front-ends. It’s a common fault of lower-priced digital products to make the presentation sound congealed, synthetic, and smeared. The RCD-990’s impression of individual objects (instruments) suspended in space was remark able, and one of its best qualities. Beyond this description of specific attributes, the RCD-990 was expressive, involving, and musical. I experienced lots of musical enjoyment with the RCD-990 in my system. The RCD-990’s maximum output level was 1.99V, right in line with the CD standard of 2V The balanced outputs had an output level of 3.96V when playing a full-scale 1kHz sinewave. The source impedance measured 120 ohms (unbalanced) and 475 ohms (balanced). DC levels were moderate at 23mV and 5mV from the left and right unbalanced jacks, respectively, and 4.5mV and 7.5mV from the left and right balanced outputs. The RCD-990 doesn’t invert absolute polarity. Testing the RCD-990’s tracking ability with the Pierre Verany Test CD revealed that the Rotel player perfectly tracked through track 50, the highest track in this torture test. The Pierre Verany disc has intentional dropouts in the spiral track that increase in length with ascending track number. The higher the track number a CD player or transport will play without skipping, the better that player’s tracking ability. The RCD-990 is only the second CD player or transport I’ve measured that could play all the way through the most severe play all the way through the most severe dropouts on the Pierre Verany disc. This excellent tracking ability doesn't mean the RCD-990 will sound any better, only that it will correctly track through fingerprints or scratches that may cause problems for other players. All the following measurements were made with the RCD-990 in the "as shipped" settings; I.e, with dither turned off. This will better show the RCD-990's true noise level in the absence of dither, Fig shows the RCD-990's frequency and de-emphasis responses, which were flat across the band. The de emphasis tracking is perfect, following the gentle frequency-response rolloff in the top octave. The RCD-990's channel separation was among the best I've measured in any digital product- regardless of price. The player measured better than 135dB of channel isolation at 1kHz -quite a technical achievement. 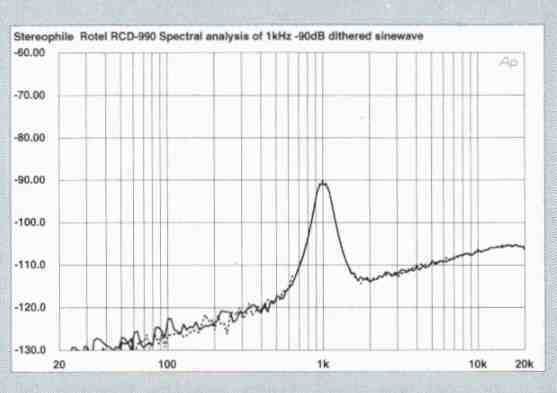 The RCD-990 s performance on the spectral analysis of a 1kHz, -90dB dithered sinewave was equally impressive (fig.2). Note the extremely low noise floor and complete lack of power-supply noise in the audio out puts. This plot also indicates that the left- and right-channel DACs are behaving identically. 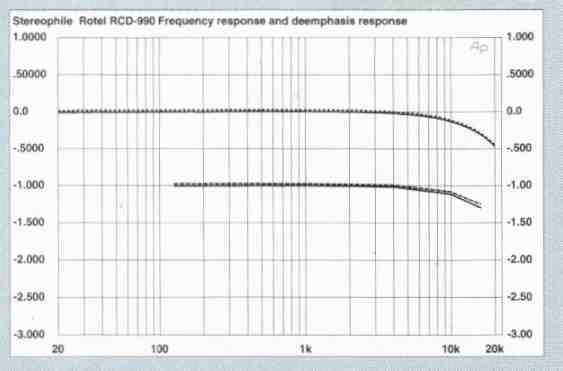 A wideband spectral analysis of the RCD-990's output when fed an input signal of all zeros (fig.3) better revealed the RCD-990's intrinsic noise floor. The previous graph was skewed by the presence of dither in the 16-bit test signal (not to be con- fused with dither generated by the PMD100 inside the RCD-990), which made it look as though the RCD-990's noise floor was higher than it actually is. Fig.3 shows the Rotel's noise floor to be astonishingly low. Note that the scale has been expanded all the way down to -150dB. The RCD-990 is one of the quietest digital products I've measured. 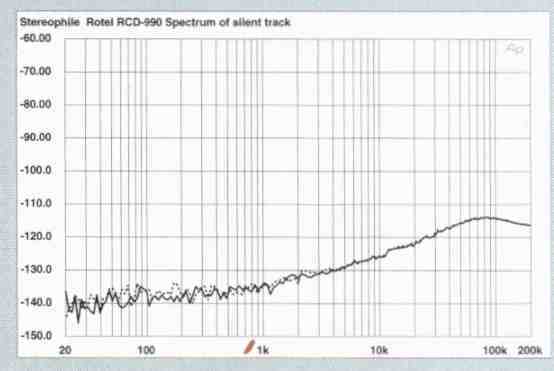 Fig 3 Rotel RCD-990, spectrum of digital silence (16-bit data, 1/3-octave analysis, right channel dashed). Fig.4 shows the RCD-990's left channel linearity, which was essentially perfect to below -100dB. The right channel had identical performance. This excellent low-level performance was confirmed by fig.5, the RCD-990's reproduction of a 1kHz, -90dB Un dithered sinewave. The quantization steps are perfectly uniform, the wave form is free from audio-band noise, and the Gibbs Phenomenon "ringing" on the waveform's transient edges can be seen. This waveform doesn't get any better-looking than this. An FFT-derived spectral analysis of the RCD-990's output when decoding a full-scale mix of 19kHz and 20kHz (not shown) revealed the player to have a clean intermodulation distortion spectrum. Oddly, however, the noise floor rises below about 3kHz. I measured a similar phenomenon in the RCD-950, although in the RCD-950 the noise floor rise was over the entire audio band In the RCD-950 the noise floor rose dramatically when the player was decoding twin tones, but not when reproducing single tones. It may just be coincidence that the two players show an increase in the noise floor when reproducing twin tones. I next measured the RCD-990's word-clock jitter at the 8x on the PCM63 DAC using the Meitner LIM Detector. 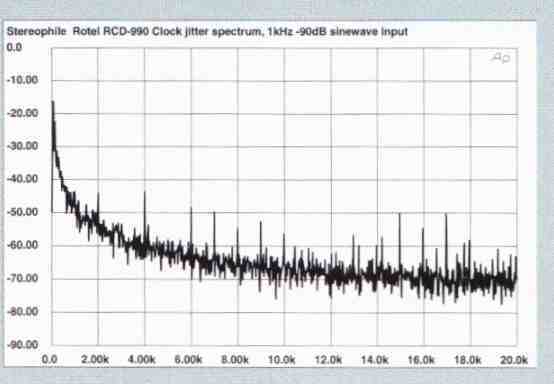 When playing a full scale 1kHz sinewave, the RCD-990's clock had the jitter spectrum shown in fig.6. The spectrum is free from periodic jitter components, and the RMS jitter level, measured over a 400Hz- 20kHz bandwidth, was only 15 picoseconds. With a test signal of all zeros, the spectrum was again perfectly clean (not shown), and the RMS jitter level dropped even lower, to just lips. A test signal of a 1kHz, -90dB sinewave, how ever, induced some periodic jitter components correlated with the 1kHz test data, seen as the spikes in fig.7. The RMS jitter level increased to 40ps. The RCD-990's technical performance was outstanding by any mea sure. The player had ultra-low noise, wide channel separation, excellent any measure. It reproduction of low-level signals and very low Jitter. I've measured $14,000 processors that didn't look this good on the bench. The RCD-990 is obviously a very well-engineered product. 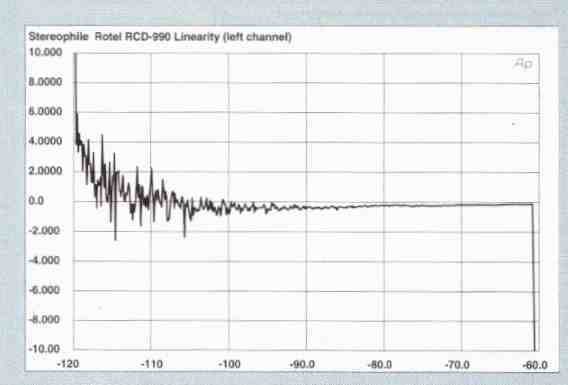 Fig.4 Rotel RCD-990, left channel, departure from linearity (2dB/vertical div.). 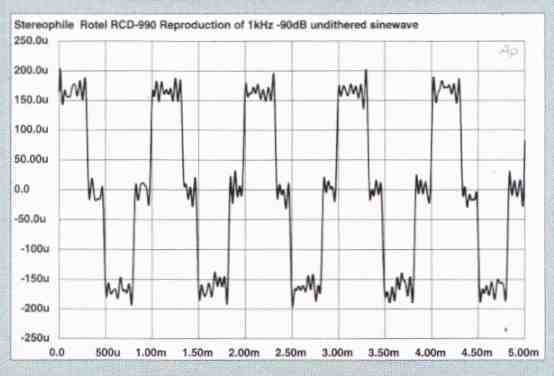 Fig.5 Rotel RCD-990, waveform of undithered 1 khz sinewave at -90.31 dBFS (16-bit data). Fig.6 Rotel RCD-990, word-clock Jitter spectrum, DC when processing 1 kHz sinewave at 0dBFS; PS Audio Lambda transport (linear frequency scale, 10dB/vertical div., 0dB=1ns. 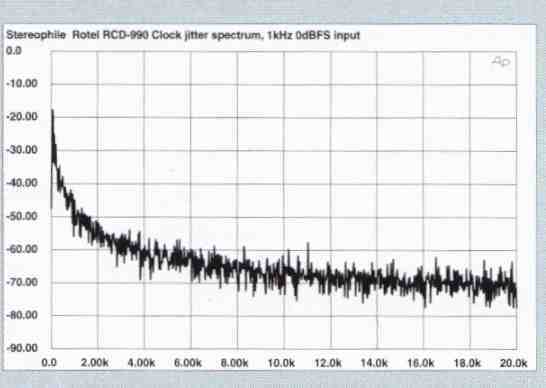 Fig 7 Rotel RCD 990 word clock Jitter spectrum DC-2OkHz, when processing 1 kHz sinewave at -90dBFS; PS Audio Lambda transport (linear frequency scale, 10dB/vertical div., 0dB=1ns). No Dither about Dither:. Using the Special Features mode to select a dither value is essential to getting the best sound from the RCD-990. Which dither you select is less important than using some dither. As I went up the scale (the numbers correspond to increasing amounts of dither), the treble became smoother-sounding and more refined. Piano lost some of the glassy edge on transients, and timbres became more pure and liquid. Adding dither warmed up the sound of piano, revealing a richer and fuller left hand. I also heard an increase in palpability with dither, yet the overall perspective became a bit more relaxed and analog-like. Instrumental images seemed to tighten, and the space around each instrument was better resolved. The soundstage also seemed to become a little more transparent, and had more bloom around the outer edges. I ended up liking dither position 6 the best. Overall, dither softened the RCD 990’s sound—a welcome improvement over the stock no-dither setting. Although the differences between settings were fairly subtle, the variable dither function nonetheless gives you that last measure of fine-tuning with which to match the RCD-990 to your musical tastes and playback system. Conclusion: After auditioning the RCD-990, I know why Rotel took the gamble of offering a CD player that sells for nearly double the price of their previous top-of-the-line machine: The RCD 990 is a giant-killer that offers a surprisingly high level of musical and technical performance for its modest price. The player sounds highly involving and enjoy able, with superb dynamics, pace, sound- staging, clarity, and an overall feeling of musical rightness. I was also impressed by the RCD-990’s bench performance, which approached the state of the art. At its price of$1495, it’s difficult to criticize the RCD-990. In absolute terms, however the player was more up-front and lively than the reference Sonic Frontiers SFCD-1 or the Audio Alchemy ACDPro. Although it has some other tradeoffs, the smoother, more laid-back ACDPro may be a better choice for some systems. The RCD-990 was also a little slow in responding to commands, and the front-panel buttons were less friendly than the ACDPro’s controls. But this is nitpicking. The bottom line is that the RCD-990 is a killer for the money, and sets a benchmark in $1500 CD players or separates. Maybe Rotel should turn their engineers loose more often.